Gatorade smart bottle brings high-tech hydration to World Cup 2014 #WorldCup2014 « Adafruit Industries – Makers, hackers, artists, designers and engineers! Geek.com posted about the latest tech designed by Gatorade to help keep athletes super hydrated. When I was little, the hydration and nutrition regimen at soccer matches involved sipping water (probably from a bottle that had been frozen the night before) and eating a few orange slices. That’s not how it works when you’re a top-notch footballer playing for a World Cup team in 2014, obviously. It’s not even as simple as just swapping out water for Gatorade or BioSteel (that pink stuff you see so many pro ballers drinking these days). Gatorade decided it was high time to get the Internet of Things involved, so they teamed up with Smart Design to develop a more modern system for keeping athletes hydrated. Each of the Gatorade smart bottles hides a sensor-packed disc with WiFi connectivity in its lid. The sensor keeps tabs on how much each player drinks, and the NIC transmits the data it collects to the cloud. 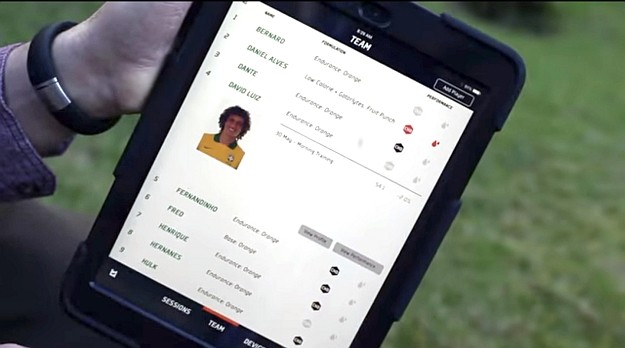 Coaches and trainers have access to a dashboard that keeps tabs on their players. When someone’s not drinking enough, a water droplet icon goes red. Everything’s logged, of course, so that the team can take a look at a player’s performance and hydration habits over time.